This is a game I played against my phone. I think I have an attacking chance with pawn storm. 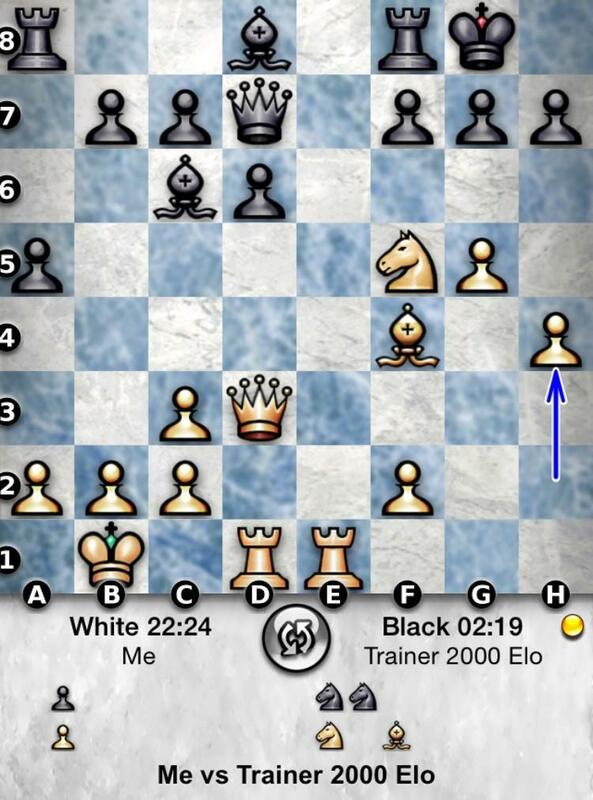 But staring at the situation for a bit, I can't find a plan to bring down black's defense. When attacking with g and h pawns against a flat f7/g7/h7 structure, where do my pawns usually go (g5/h6 or g6/h5?)? How to coordinate my other pieces? Any general suggestion or illustrative games I can follow to see how this is done? The idea of a pawn storm is to exchange pawns and open files; so the 'usual' defence against a pawn storm is to keep the files closed, which often entails responding to an offer to swap pawns by advancing your own, e.g. if white plays h6, black will want to play ...g6. So from the attacker's viewpoint, you will want to make use of the weaknesses created by any change in your attacker's pawn structure, or force a pawn exchange. In the position you have given, your pieces are not too well placed; only your knight plays a role in the attack on the king, and the queen is ready. The bishop on f4 is a liability in lines where the f-file is opened, and you would much rather have a rook on g1. Personally, I would prefer to start with Rg1 because in almost all cases, you will need to put a rook on the g-file. In fact, after this move you are threatening 2. Qd4, forcing 2 ...f6 where black's position collapses after 3. Nxg7. You are threatening 2. h5 and 3. g6, after which your position will be crushing, because of the piece sacrifices you have available. You usual concern as the attacker (especially when material is equal) is the counterattack of the opponent, as the success of your attack is only a matter of time. In the case of this position, black's a4-a3 advance is too slow (you can even ignore it and allow ...axb2 and your position is not immediately busted yet), so you can even ave the luxury of making another prepatory move like Be3. For any attack against the king, the attacker generally wants to force the advance of the pawns covering the king, so pawns on f7-g7-h7 are usually the most resistant to an attack. Often he does this by tempting the move ...h6 by placing a piece on g5. This position looks much like the Petroff after 1. e4 e5 2. Nf3 Nf6 3. Nxe5 d6 4. Nf3 Nxe4 5. Nc3 Nxc3 6. dxc3, and is probably what you played if I had to guess. I recall Morozevich winning a game in this line as white, which you could probably look up. There are many plans for White here. One is h5 and then g6 depending on whether the Knight on f5 hangs after fxg6. If instead black plays ...h6 you sack a piece on h6. Otherwise you can consider gxh7 check and attacking on the g file. Another plan is h6 and opening lines on the kingside. It seems that your pieces are not that well co-ordinated for these plans though. All of this depends on concrete analysis. I would suggest the first move as 1.h5, with the idea h6, Qd4 and Qxg7 checkmate. If Black plays 1...f6 thwarting this idea then g6 and transposes to the ideas above. If Black plays 2...f6 then 3.fxg7. If 1...g6 then you have the option of hxg6 at any point in the future. edit eg after Rh1. The thing is that pawn storms work best if the centre is closed. Otherwise piece activity in the centre of the board usually easily out weights the benefits of a pawn storm. The dictum goes: Counter a flank attack with a strike in the centre! Here the closest thing to a counter strike in the centre is 1…f6. This opens the g-file for you, but it also activates the Bd8 and the Rf8. Especially the Rf8 is nasty, because you have two pieces and a pawn lined up on the f-file and they all lack protection. Now if you had a rook on g1, you could answer 1…f6 with 2.g6. That would be pretty sweet because 2…h6 runs into Bxh6 and 2...hxg6 opens the g-file without opening the f-file. This leads me to the conclusion that h4 may have been a mistake. Still, 1…f6 2.g6 hg 3.Nd4 might still give you real attacking chances. If for some reason black doesn't play f6, advancing your pawns is not very convincing, because you have a hard time opening the g-file without opening the f-file for black. Better you regroup with Rg1-g3, possibly f3 if Re8 comes. Later Be3-d4 is a strong idea. Not the answer you're looking for? Browse other questions tagged pawns attack or ask your own question. Pawn confrontations: capture, push past, or leave the tension? How to break through a stubborn Semi-Slav? Why is it better to capture the f pawn?